Research is increasingly demonstrating a relationship between mental health disorders and diabetes. 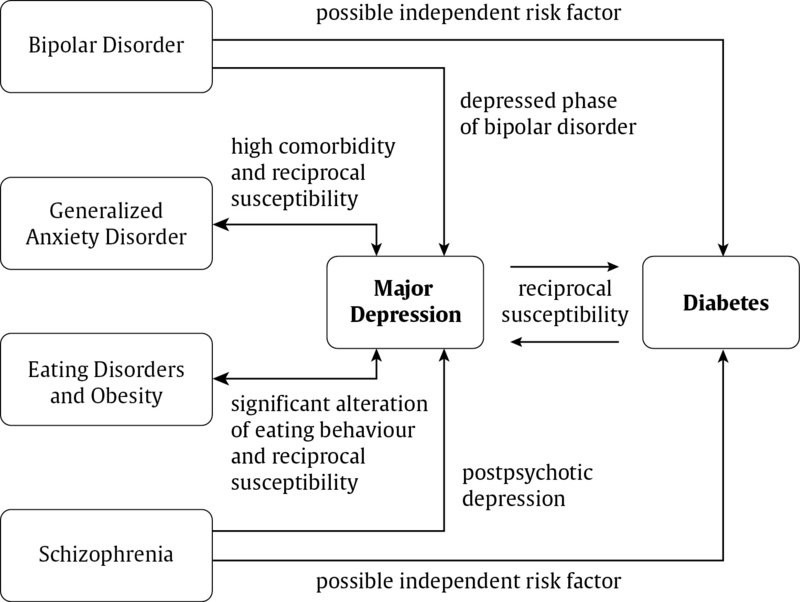 Patients with serious mental illnesses, particularly those with depressive symptoms or syndromes, and patients with diabetes share reciprocal susceptibility and a high degree of comorbidity. The mechanisms behind these relationships are multifactorial. The use of second-generation (atypical) antipsychotic agents, biochemical changes due to mental health disorders and lifestyle changes may be contributing factors. The prevalence of clinically relevant depressive symptoms among patients with diabetes is in the range of 30%. The prevalence of major depressive disorder (MDD) is approximately 10%, which is double the overall prevalence in people without a chronic medical illness. Depression in patients with diabetes amplifies symptom burden by a factor of about 4. Individuals with depression have an approximately 60% increased risk of developing type 2 diabetes. Episodes of MDD in individuals with diabetes are likely to last longer and have a higher chance of recurrence compared to those without diabetes. Psychological stress, leading to chronic hypothalamic-pituitary-adrenal activation with cortisol release. Comorbid depression worsens clinical outcomes in diabetes, possibly because the accompanying lethargy lowers motivation for self-care, resulting in lowered physical and psychological fitness, higher use of health care services and reduced adherence to medication regimens. Depression appears to worsen cardiovascular mortality. One study estimated that 14% of individuals with diabetes suffered from generalized anxiety disorder, with double this figure experiencing a subclinical anxiety disorder and triple this figure having at least some anxiety symptoms. Eating disorders, such as anorexia nervosa, bulimia nervosa and binge eating, are more common in individuals with type 1 or 2 diabetes than in the general population. Up to 50% of patients with eating disorders also have depressive symptoms. Type 1 diabetes in young adolescent women appears to be a risk factor for development of an eating disorder. Night eating syndrome (NES) has been noted to occur in individuals with type 2 diabetes who have depressive symptoms. This is characterized by the consumption of >25% of daily caloric intake after the evening meal and waking at night to eat, on average, at least 3 times per week. NES can result in weight gain, poor glycemic control and an increased number of diabetic complications. Schizophrenia (SZ) and other psychotic disorders may contribute an independent risk factor for diabetes. According to the Clinical Antipsychotic Trials for Intervention Effectiveness (CATIE) study, of the individuals with SZ who participated in the study, 11% at baseline had diabetes (type 1 and 2 combined). The prevalence of metabolic syndrome was approximately twice that of the general population. Psychiatric medications (primarily second-generation/atypical antipsychotics, but in some cases antidepressants as well) have the potential to affect weight, lipids and glycemic control in patients without diabetes. Regular and comprehensive monitoring of metabolic parameters is recommended for all persons who receive antipsychotic medications, whether or not they have diabetes. Diabetes, both type 1 and 2, is a psychologically challenging disease for patients and their family members. It interferes with quality of life and is a risk factor for diabetes-related distress as well as psychiatric disorders. Challenges accompanying the diagnosis of diabetes include adjustment to the disease, adherence to treatment and psychosocial difficulties. Stress, deficient social supports and negative attitudes toward diabetes can impact on self-care and glycemic control. Diabetes management strategies ideally incorporate a means of addressing the psychosocial factors that impact on individuals and their families. Identifying depressive syndromes in diabetes is important since depression is a risk factor for poor diabetes self-management and outcomes, including early mortality. MDD has been found to be under-diagnosed in people with diabetes. Diabetes distress describes the feeling of hopelessness and emotional turmoil related specifically to having the condition, the need for continual monitoring and treatment, persistent concerns about complications and the potential erosion of personal and professional relationships. Distinguishing between diabetes distress, MDD and the presence of depressive symptoms is important because these psychological experiences are different, and of the three, diabetes distress may be most strongly related to adverse diabetes outcomes. Individuals with diabetes should be regularly screened for subclinical psychological distress and psychiatric disorders (e.g. depressive and anxiety disorders) by interview [Grade D, Consensus] or with a standardized questionnaire [Grade B, Level 2]. No data presently demonstrate the superiority of one particular depression screening tool over another. Currently available screening instruments have a sensitivity of between 80% and 90% and a specificity of 70% to 85%. Cognitive behaviour therapy (CBT) alone [Grade B, Level 2] or in combination with antidepressant medication [Grade A, Level 1] may be used to treat depression in individuals with diabetes. No evidence presently shows that the combination of CBT and medication is superior to these treatments given individually. Gains from treatment with psychotherapy are more likely to benefit psychological symptoms and glycemic control in adults than will psychiatric medications (which usually only reduce psychological symptoms). A meta-analysis of psychological interventions found that glycemic control (A1C) is improved in children and adolescents with type 1 diabetes. Furthermore, evidence suggests interventions are best implemented in a collaborative fashion and when combined with self-management interventions. Antidepressant medication should be used to treat acute depression [Grade B, Level 2] and for maintenance treatment to prevent recurrence of depression [Grade A, Level 1A]. Psychiatric medications have the capacity to affect metabolic parameters and cause changes in weight, glycemic control and lipid profile and in some cases can have immunomodulating effects. The CATIE study investigated 4 aspects of the effectiveness of antipsychotic medications: efficacy, tolerability, emergence of medical problems and patient choice. The results indicated that some antipsychotic medications were more likely to cause weight gain, worsen glycemic control and induce unfavourable changes in lipid profile. However, when these effects were considered in the context of efficacy, tolerability and patient choice, no conclusive statements could be made about which medications to clearly use or which to clearly avoid. Should medical problems arise while a patient is taking psychiatric medications, clinical judgment should be used to determine whether lifestyle modifications, adding a medication to address the emergent issue (e.g. side effect or medical complication) or changing the psychiatric prescription, is the most reasonable step. If you would like more details on this topic, please visit the Canadian Diabetes Association Clinical Practice Guidelines: Chapter 18.